Book Information: Let’s Party! 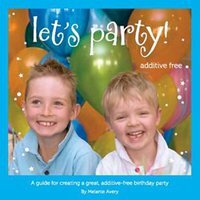 Additive Free is the perfect guide for parents who want to give their children (and their children’s guests) a great birthday party while avoiding artificial ingredients that can affect childrens behaviour and well being. Let’s Party! Additive Free is full of easy to follow recipes and party ideas, highlighted with colourful photographs and handy hints. Provide your children with yummy food that does not contain artificial ingredients and you can have peace of mind that they are not at risk of any adverse reactions while still giving them a party to remember! • A basic introduction to artificial additives, their types and how they can affect our children. • A breakdown of common party foods, their ingredients and the possible reactions to these ingredients. • Ideas for decorations, prizes and take home treats. • Yummy party food recipes. • Shopping lists for store-ready party food as well as recommended ingredients for recipes. Brief Bio: Melanie Avery is a busy mum with three children. She discovered the need to get back to basics for children’s parties so that her children could still have a great birthday party whilst remaining additive free. Her family has embraced an additive-free diet and the results speak for themselves with everyone enjoying the benefits of a decrease in mood spikes, erratic behaviour, headaches and restless nights, just to name a few.